Finding out your image has been made into a meme must be a disorientating experience, and no doubt there are plenty of moths out there who now feel extremely self-conscious about their love of lamps. And it doesn’t even bear thinking about what it must be like to be a big cow or a post-surgery grape as this strange, meme-packed year comes to a close. 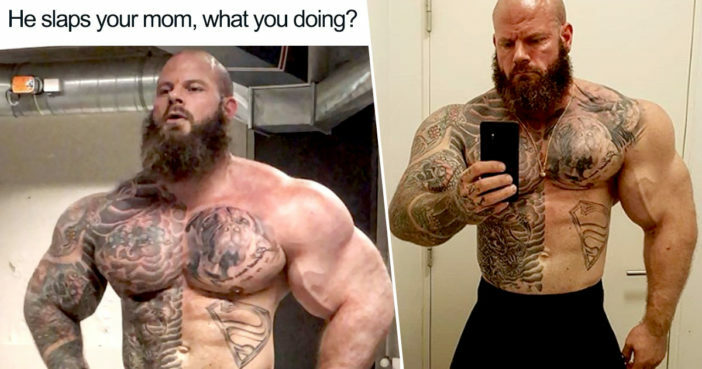 When colossal bodybuilder Søren Falby, from Denmark, found out a picture of his bulging muscles had been doing the rounds online with a questionable captions, he reacted perfectly. The joke of course was, if someone of this size and build was threatening to slap your mother, it would be pretty damn frightening/impossible to attempt stand up to him. 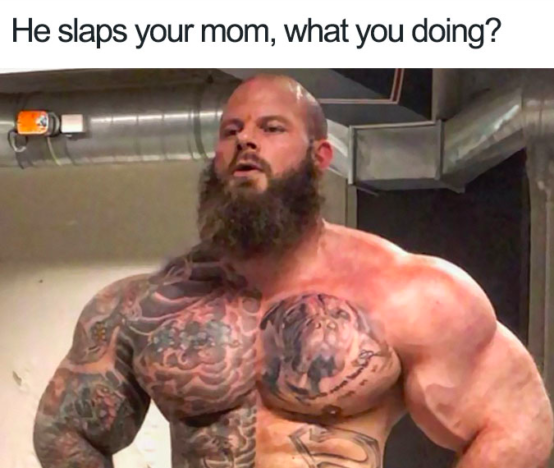 I’m not gonna slap anyone’s mom.. I love my mom to death and she would kill me if I ever slapped a woman. A picture of me and my mom. Søren then shared an adorable picture of himself with his arm around his mum, showing how true strength comes from love and not from being big and scary. My mom has been my rock my whole life, This is the person who made me the man I am today… This is without a doubt the one person who had the most influence on my life. I wish you all could meet my mom. She is the most wonderful person in the world and I love her so much. As well as plenty of fitness shots, Søren’s Instagram is also full of photos of him cuddling up with his girlfriend, Malene Larsen, as well as his beautiful dogs. One picture even shows him mucking about wearing Malene’s dress, showing he isn’t afraid to have a joke. Okay guys….. my picture is obviously gone viral and being posted everywhere and I’m glad that one of the pictures is with my response to the memes, but the original memes is f***** up and I hate that my picture is getting used to that kind of bull s***…. so let me make it perfectly clear. I’m not going to slap anyone’s mom, girlfriend, unkel [sic], grandmother or any other of your family member…. thank you. What an absolute teddy bear. Just goes to show, you should never judge a person by their outer appearance!